Let’s Kick-Off the Fall Season with Vacation Fun & Entertainment! 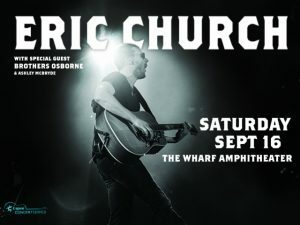 Simply login to Facebook and share Sugar Sands Realty & Mgmt’s post from August 25th, titled, “Labor Day Special/Contest” with 3 friends and enter to win 2 tix to see ERIC CHURCH on Saturday, 9/16 at the Wharf!!! Winner will be announced on Friday, 9/8. Stay tuned for updates! *NEW RESERVATIONS ONLY. SOME UNITS DON’T PARTICIPATE.